At first, I wasn’t very impressed with the idea of a portable, rechargeable light. Big whoop, so you can walk around with it, right? Well after reading about the benefits, the facts made me think otherwise. We featured the Nightmare Snatcher Journals and how they can help kids over come their fears of having bad dreams, but this can help kids with their fear of darkness. Candeloo Lamps can be left by the bed as a night light, because they are portable. If kids need to find the bathroom at night, they can bring this cool lamp with them to ward off any monsters hiding in the hallways. What, you don’t have a monster problem? I’m remembering how, as a kid, the bathroom was on the other side of the house from my room. I definitely would have definitely used one of these, had they been invented in the mid to late 80′s. If I had one of these portable rechargeable lamps with me I wouldn’t have felt the need to run past all those scary shadows in the middle of the night. But don’t worry parents and other grown-ups, they are also useful for when you have to get up for a midnight snack and the main lights are just too much for those sensitive eyes of yours. They can also be set to pulse gently helping those restless ones get to sleep a little easier. As an added bonus these Candeloo Lamps are kid safe because there are no exposed electrical contacts. When you’re not using them just place them back on their charging base and they will recharge without any further switch flipping or button pushing. They’ve been featured by Wired magazine and Parenting Magazine (just to name a few) and come in various colors. A few years ago I purchased a star projector toy, imagining and hoping that it would transform my bedroom into my very own planetarium. Like many people, stars and starlight have always held a special fascination for me. Who doesn’t enjoy stargazing every now and then? Those teeny twinkling specks of light remind us of the enormity of the galaxy, and are just so beautiful to behold. Well, imagine my disappointment when said child’s toy failed to create anything resembling a sky full of stars. Instead I saw blurry smears over a small section of my ceiling. I packed up the plastic hunk of junk, returned it to the manufacturer, and wondered if I would ever get that starlit bedroom that I so dreamed of. Fast forward a few years and someone finally got it right! The Laser Star Projector is not a toy and promises to “fill any room from the tiniest bedroom to the largest warehouse with a crystal clear animated star display“. Yes, it’s animated, too! You’ll see thousands of green laser stars and blue clouds (along with the occasional shooting star) that are constantly moving and morphing. Everyone who sees it in person supposedly has an OMG moment, and I can’t wait to try it out for myself. OK, I may not have a jetpack or servant robot yet, but this kind of technology will pacify me for now. These new chandeliers make me want to redecorate my whole house. The nouveau baroque look makes a perfect contrast to the predominately black coloring. It reminds me a bit of something you’d see at Urban Outfitters, but with more sophisticated details: kind of a gothic Marie Antoinette vibe. In the past, chandeliers had a stuffy feel to them, usually looking appropriate only in really swanky rooms. Today a contemporary chandelier or chandelette can create a soft, casual atmosphere similar to candlelight. A black chandelier would make an amazing focal point for any room and can bring out the beauty of your existing decor. If black lighting isn’t your style, never fear: Gigglebrush offers many other styles and colors, including pink chandeliers and scones. They offer “couture lighting” with quality materials such as leaded crystal, glass and solid brass components, so your gorgeous lighting will stay that way. The weather is changing and that means we get to spend more time outside. Good outdoor lighting can really make a difference and I think everyone should have some glowing orbs lying around their backyard. These aren’t just your ordinary light up orbs though. Since it’s officially Earth Day I thought I’d recommend these solar powered glowing orbs from Hammacher. Not only do these collect the sun’s energy during the day, they also gradually change colors to create some relaxing ambient light at night. Their sturdy translucent plastic globe is watertight and can be left floating in a pool or set upon it’s stand for table illuminations. 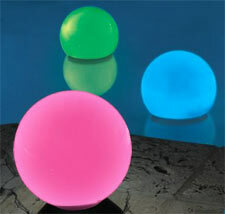 The bright LEDs slowly turn blue, pink, and green and the orb can detect darkness to turn off automatically at dawn. Ever used your sink directly after someone else and were unpleasantly surprised with scalding hot water? Well now you can color code your water with this heat sensitive LED faucet adapter from ThinkGeek. Just to state the obvious; red water means hot (89 degrees or higher) and blue means cold. I’m a little leary about the fact that this extends your faucet quite a bit (2.25 inches), but if you have the room in your sink, then I’d definitely join the cool kids on the block and get one. Midnight trips to the bathroom, tooth brushing, even simple face washing would become fun just by using this technological marvel. This LED faucet light attachment comes with two universal adapters for use with almost any standard faucet in the USA. Be sure to check out the customer action shots to see all the fun others are having. Turn your lights on before you enter your home with this easy to use remote controlled outlet device. Rated for indoor or outdoor use these simply go between your lamp (or whatever you want to power remotely) and the wall socket and suddenly you have wireless command of these devices. I think this would also be great when heading downstairs for that late night snack or turning on outside lights without actually having to go outside. Visions of an instant party atmosphere also dance in my head with mood lighting, music, and fog machines being turned on with a single click of your remote. If you can think of any out of the ordinary uses for this device feel free to leave a comment to share with the rest of us. When redecorating your new living space for that retro/vintage look, one of the easiest and most effective ways to go retro is with lighting. Most places have built in lighting so let’s take a look at what kind of retro makeover we can do for cheap. Ceiling fixtures are a great place to start because of how easy they are to replace. Plus they are readily available on eBay, and if you are lucky you’ll be able to find one close to your location so you don’t have to pay much for shipping. Searching eBay for retro lighting turns up so many results that you’re forced to weed through it all to find the good stuff, so I’d recommend narrowing it down by category. In this case we can go straight to the Ceiling Fixtures section within the Lamps, Lighting, Ceiling Fans category. Then just search with the keyword retro and pick and choose the style that looks best to you. Some of these ceiling fixtures are so simple and easy to install it just takes a couple minutes to unscrew the one thumbscrew that’s holding the fixture in place and replace it with your new retro fixture. A good example, and one of our favorites, of this is the light shade type cover (pictured at left). It’s usually in a square shape, hides two light bulbs, and has one hole in the middle from which it’s held in place. A lot of retro and vintage items on eBay are from people getting rid of their old stuff. So buying retro decor items from eBay gives your home the unique look that isn’t available at your nearest IKEA or Target. RELATED: Retro Kitchen Appliances, Retro Aprons. Are your USB ports working for you? Usually we connect a boring printer, web cam, or mouse to these ports, but chances are you have a few ports not being utilized. Manufactures have taken advantage of the fact that USB can deliver power from your PC to a small device by creating fun toys that plug into our computers that don’t even involve the rest of the computer. You can get a USB powered beverage cooler, a beverage warmer, or an Air Purifier and Clock. Add some fun into your work day with a USB powered missile launcher. If you like the missile launcher make sure to check out this Circus Canon Launcher as well. For the ultimate in computer desk decor try a mini lava lamp or a 6 color cycling mini Christmas tree. A more useful USB powered item might be a personal fan, or a reading light with just enough light to brighten up your keyboard for all your midnight surfing. For added decor try a mini lamp complete with retro orange lamp shade. If you don’t have any spare USB ports you can always plug in a USB hub that turns 1 port into more. How many more? It’s up to you, add 3, 4, or up to 7 more ports. 7 free USB ports would allow for quite the arsenal of missile launchers. Bring these toys along for the ride in your car with a FirePod that converts your any 12V automotive DC power source (lighter) into a USB and Firewire port. Stringing lights up around the edges of your home is so 1900′s. We haven’t seen much advancement in styles other than more colors and “icicle lights”. Now, thanks to technology, we can project fun shapes on the sides of our homes. Well that’s why there is this Light Display Projector. It’s a device that shines bright light onto your house, or where ever you have it aimed, with a filter to make amusing shapes that float by. These are typically used most during the Halloween and Christmas seasons, but it can be used all year long. It’s great for letting visitors know which house is having the birthday party, wedding, graduation, etc. Tell them to look for the house with the flying deer, stars, balloons, skaters, witches, bats, ghosts or snow flurries all over it. These are all the shapes it comes with, but I’m curious to know if you can easily make your own. There is a mirror ball inside that you can adjust to determine the direction at which things are flying by as well as a switch to adjust the speed of their flight. Each design is on an interchangeable slide that easily slips in and out of the light projector. The projector comes with a sturdy stand to help keep it upright even in the lawn and plugs into a regular AC outlet. Anyone know of any modifications or homemade slides for this? I’d definitely be interested in hearing from you. Welcome to Mable's Unique Shopping Blog! It's filled with our favorite fun and unique products, with a focus on vintage fashion, eco-friendly, and being your authentic self. Please contact us at with comments, questions, or advertising inquiries. Enjoy! Mables.com is happily hosted by carbon-neutral, employee-owned DreamHost. Use coupon code "IAMAWESOME" to get $25 off and get your website TODAY.